Want to be a Captian Doctor in Pakistan? Want to know the complete procedure? 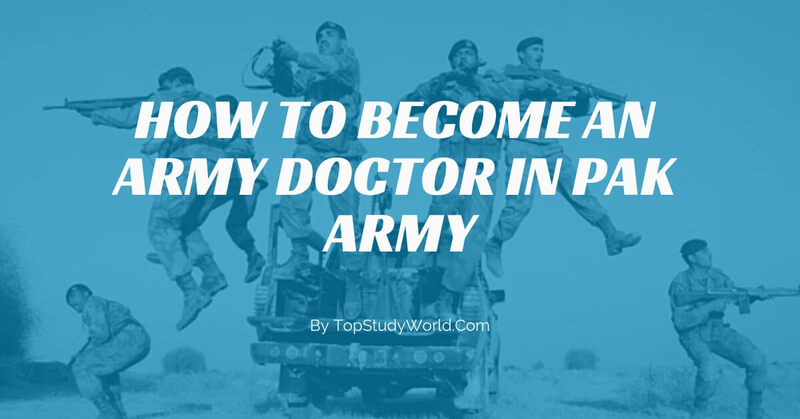 I am writing this article for those who want to serve our army following their passion of becoming a doctor. Becoming a part of the military and serving your nation in any possible way is the most prestigious job for the youth of a country. Pakistani teenagers are most passionate about becoming a doctor or an engineer, but most of them are unaware of the procedure via which they can become part of Pakistan Army as a doctor or an engineer. Today, I would elaborately talk about the methods particularly of becoming an Army doctor. Army Medical College famous as AMC is a dream college of many medical students. They dream about wearing those flags on their chests. There is a common confusion that only army brats or people with a military background can become part of AMC but this is not the case at all. Anyone can be the part of AMC family provided he or she meets the criteria. If we talk about girls, they have a confusion that whether they could be a part of AMC or not. It is a common misconception that only boys could apply. Let me give good news to girls, AMC enrolls female cadets as well. Paying cadets are the ones who have military background whether their mother or father is serving Army, Navy, Airforce or Civil Services. No matter at which rank they are serving, their children can apply for paying cadets seats of AMC. Candidates with army background have maximum seats in paying cadets quota than any other forces especially the children of martyred have the edge over others. High concession in fees too low follows their merit. These cadets after clearance wear army uniform and are serving or bonded cadets which mean that army is going to recruit them in CMHs after their MBBS or BDS. How to get registered for the NUMS TEST? As soon as you apply for NUMS test, get a form from respective headquarter of any of three armed forces where your parents are serving or from which they got retired. Without submission of this form, you cannot join AMC as paying cadet. This is the category of most lucky people. For this, you are supposed to register yourself on the official website of the army. There is dropdown named as “induction criteria” which shows AM CADET COURSE. The registration for this course begins in May or June. The whole procedure is divided into 4 phases. First of all, there is an ‘initial test’. This is an academic test and intelligence test. After clearing this test, you appear in the physical test where you do chin-ups, push-ups, and all other physical activities to show your fitness and stamina. Following this test is ‘medical test’. You are examined in CMH regarding your medical health. In the last, there is ‘interview’ which is conducted by GHQ selection board. One important thing that I would like to mention here is that NUMS entrance test has to do nothing with the selection of MEDICAL CADETS. Clearing all these four steps to lead you to serve army even when you are in AMC. You are provided with a scholarship of 30,000 plus there is no fee for MCs. All medical cadets are not enrolled in AMC or in MBBS. Depending upon the merit, they are adjusted in MBBS and BDS. Few cadets are sent to CMH College Multan, Quetta, Khariyan and Lahore as well. After completion of the degree, medical cadets spend 6 months in PMA for basic military training and after that, they are posted to different CMHs as captain doctors. How to apply for MC? Once you are done with all tests and have passed GHQ interview, you are deported into AMC and rest army-affiliated military colleges. MC signs a bond with the army for serving it for 13 years after the completion of their degree. GDMO stands for ‘general duty medical officer’. SPECS stands for ‘classified specialist’. GDDO means ‘general duty dental officer’. FCPS is for classified specialists and ‘PTC’ is ‘ Pakistan temporary commission’. GDMO is a course that is offered by all three armed forces of Pakistan i.e. navy, air force, and army. Anyone has done with MBBS degree from any medical college whether it is private or government provided it is registered from PMDC, can get registered in GDMO course. After clearance, of course, you are given the rank of Capt. Doctor posted in any CMH. Keep in mind that only boys can apply for GDMO after BDS, girls can go for it if they have an MBBS degree. Age should be in between 28 years to 35 years. These are the people who have specialization in anesthesiology, pathology, basic medical sciences, and gynecology (only females), the surgeon as well. They are inducted as CAPT. DOCTORS. Only males with BDS degree can apply for GDDO with an age relaxation up to 35 years. Only males can apply with an age limit of 35 years. If we talk about the registration procedure, it is done both online and offline. For online, go to official website of Pak army i.e. www.joinpakarmy.gov.pk and get registered. Candidate must have computerized roll number slip on the day of the test and should pay for prospectus fee before the test. Test date and center are never changed.